As a leader, one of your most important roles is to coach your people to do their best. By doing this, you’ll help them make better decisions, solve problems that are holding them back, learn new skills, and otherwise progress their careers. Some people are fortunate enough to get formal training in coaching. However, many people have to develop this important skill themselves. This may sound daunting but, if you arm yourself with some proven techniques, practice, and trust your instincts, you can become a great coach. The GROW Model is a simple yet powerful framework for structuring your coaching or mentoring sessions. We’ll look at how to apply it in this article, video and infographic, below. The model was originally developed in the 1980s by business coaches Graham Alexander, Alan Fine, and Sir John Whitmore. A good way of thinking about the GROW Model is to think about how you’d plan a journey. First, you decide where you are going (the goal), and establish where you currently are (your current reality). You then explore various routes (the options) to your destination. In the final step, establishing the will, you ensure that you’re committed to making the journey, and are prepared for the obstacles that you could meet on the way. In its traditional application, the GROW Model assumes that the coach is not an expert in the client’s situation. This means that the coach must act as a facilitator, helping the client select the best options, and not offering advice or direction. When leaders coach their team members, or act as mentors to them, this may or may not apply. On one hand, it’s more powerful for people to draw conclusions for themselves, rather than having these conclusions thrust upon them. On the other hand, as a team leader, you’ll often have expert knowledge to offer. Also, it’s your job to guide team members to make decisions that are best for your organization. that she wants to achieve. Make sure that this is a SMART goal: one that is Specific, Measurable, Attainable, Realistic, and Time-bound. How will you know that your team member has achieved this goal? How will you know that the problem or issue is solved? Does this goal fit with her overall career objectives? And does it fit with the team’s objectives? Next, ask your team member to describe his current reality. This is an important step. Too often, people try to solve a problem or reach a goal without fully considering their starting point, and often they’re missing some information that they need in order to reach their goal effectively. As your team member tells you about his current reality, the solution may start to emerge. Does this goal conflict with any other goals or objectives? Once you and your team member have explored the current reality, it’s time to determine what is possible – meaning all of the possible options for reaching her objective. Help your team member brainstorm as many good options as possible. Then, discuss these and help her decide on the best ones. By all means, offer your own suggestions in this step. But let your team member offer suggestions first, and let her do most of the talking. It’s important to guide her in the right direction, without actually making decisions for her. What if this or that constraint were removed? Would that change things? What factors or considerations will you use to weigh the options? What do you need to stop doing in order to achieve this goal? What obstacles stand in your way? By examining the current reality and exploring the options, your team member will now have a good idea of how he can achieve his goal. That’s great – but in itself, this may not be enough. The final step is to get your team member to commit to specific actions in order to move forward towards his goal. In doing this, you will help him establish his will and boost his motivation. So, what will you do now, and when? What else will you do? What could stop you moving forward? How will you overcome this? When do you need to review progress? Daily, weekly, monthly? A great way to practice using the model is to address your own challenges and issues. By practicing on your own and getting yourself “unstuck,” you’ll learn how to ask the most helpful questions. Then, write down some stock questions as prompts for future coaching sessions. The two most important skills for a coach are the ability to ask good questions and the ability to listen effectively. Don’t ask closed questions that call for a yes or no answer (such as “Did that cause a problem?”). Instead, ask open ones, like “What effect did that have?” Be prepared with a list of questions for each stage of the GROW process. Use active listening skills and let your “client” do most of the talking. Remember that silence provides valuable thinking time: you don’t always have to fill silence with the next question. 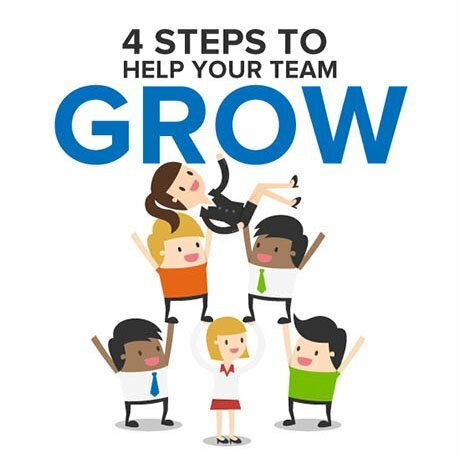 You’re helping a team member, Julie, achieve her goals using the GROW Model. Julie says that she would like a promotion to team leader within the next two years. This is a SMART goal – it’s specific, measurable, attainable (as she already has one year of experience, and there are several team leader positions in her department), relevant (both to Julie’s overall career aspirations and the team’s mission), and time-bound. You and Julie now look at her current reality. She’s in an entry-level position, but she already has some of the skills needed to be team leader. You brainstorm the additional skills that she’ll need in order to be successful in a team leader role: She needs more experience of managing other people, and experience dealing with overseas customers. She also needs to continue performing well in her role, so that she’ll be considered for a promotion when one is available. You then both review her options. To get the experience she needs, she could lead a small team on a small project. She could also spend time in the overseas team. Finally, you establish the will. As her manager, you offer to let her lead a small team on a minor project. If she performs well, she can take on additional projects with more responsibility in the future. Julie must also approach the overseas team to arrange to spend time in that department, and continue performing well in her current role. You agree to review her progress in three months’ time. The GROW Model is a simple four-step process that helps you structure coaching and mentoring sessions with team members. You can use the model to help team members improve performance, and to help them plan for and reach their longer-term career objectives.